The first round of the RS FevaXL Fat Face racing Circuit took place last weekend on the upper reaches of Chichester Harbour. A total of 26 boats, eight races, glorious sun, and some pleasant light to moderate breeze were the salient features of the event. Several hot teams fresh from the Optimist fleet joined many parent/child teams for some real nip and tuck racing with the overall result going right down to the last race. Frances Peters and Olivia Pettit from Hayling Island SC set their stall in the opening race with a win and followed it with two 2nds and OCS to lead overnight. Local guru and RYA racing supremo John Derbyshire sailing with son Harry notched in 4,1,4, narrowly holding off Oppie sailors Alex Ekstrom / Ed Whitehouse, from Bowmoor, and Alec Henry / Henry Maxfield, from HISC. Sunday looked gloomier, and definitely doubtful on the wind front, but racing got underway on time, and the wind gods eventually smiled. Frances and Olivia, sailing their aptly named “Feva Divas”, choked in the fifth race with a ninth, sailed in the patchiest wind, but regained the lead overall with two wins in the sixth and seventh races. The competition was hard on their heels though, Alec and Henry had stayed consistent with 3,4,4, Jamie Knill and Mark Lees from Poole YC scored 5,2 in the fifth and sixth races, but sealed their fate in the seventh race with an 8. As John Derbyshire and various local crews slipped from favour with 7,7,2, so Feva designer Paul Handley and son Alastair moved up with 2,5,3. And so to the last race. Alec and Henry led from the outset to build a substantial lead, requiring Frances/Olivia to stay in the top eight. Finishing fifth, they maintained the lead to win the first ever Feva open. Paul and Alastair Handley held onto third overall from Jamie/Mark whilst John Derbyshire slipped to fifth overall. Finishing eighth overall, James Peters (10) and Peter Henry (12) from HISC were first juniors, struggling after losing a win in race four for an OCS. 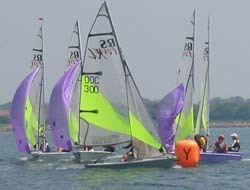 The racing was videoed and full debriefs were held following the racing by RYA coach Tracy Moss.